One of the only bands that can brutalize, mesmerize, and kill an audience as well as Pantera, Sepultura deliver non-stop metal mania on their latest, Nation. A prime example that, though metal is the ragging trend these days, you can still keep it real (i.e. not rap or go pop metal) and still keep your audience kicking and screaming for more. 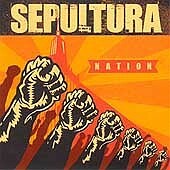 From "Sepulnation" to "Revolt" and "Saga," Sepultura make classic modern metal with enough piss and vinegar to influence and motivate a few generations of metal rockers to follow. I'll give this a B-.